CNN has released an interesting map that will be continually updated throughout the election year. 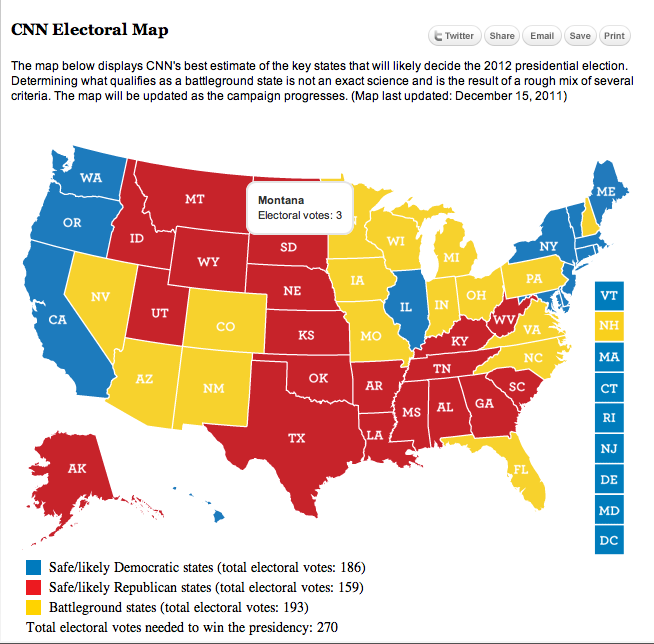 The map shows CNN predictions for how they believe states will perform during the 2012 presidential election. The heading says that the map will be updated as new information becomes available. Probably the most interesting aspect of the map are the locations of the battleground states. Battleground states are those places that will have tough competition between the candidates. Also, another interesting feature of the map is that the total number of electoral votes is also included. This allows you to see which battleground states might really play a big part in the upcoming election. Keep an eye on this map as the election progresses. Here is a screenshot of CNN's map.